Asphalt shingles continue to be a popular roofing material of choice for many homeowners. Thanks to advances in manufacturing, they have become even more durable, flexible and dynamic than ever before. In today’s blog post, King Roofing, LLC takes a look at the step-by-step process behind the production of top-notch asphalt shingles. It all starts with the base material made of either organic felt or fiberglass. Cellulose from recycled paper or wood make up the organic felt mats, while fine glass filaments mixed with water form a pulp that will become the fiberglass mat. The process starts with the long mats of base material being fed to the roofing machine. They move along the equipment like an accordion, in which they are prepared to be soaked with hot asphalt. Before it gets saturated with hot asphalt, the mat gets sprayed on one side to remove any moisture. It will then go to the saturation tank, where the hot asphalt coats the base material. In this process, the mat is formed into accordion-like folds once more to cool. This time, however, the hot asphalt gets drawn to the material for better saturation. The coated mat is far from the finished product that can protect the home from storm damage and other harsh elements. In this process, another layer of asphalt is applied, but with added stabilizers or “fillers” to ensure durability. They then undergo mineral surfacing, where granules are embedded on the top side of the mat to give color to the would-be shingles and provide resistance against UV rays. The mat then passes to another looper to cool it down completely. The treated base material now resembles the look of asphalt shingles. It will be fed it into a machine to cut them into different sizes as required. They are then bundled and wrapped for packaging, ready to be distributed. 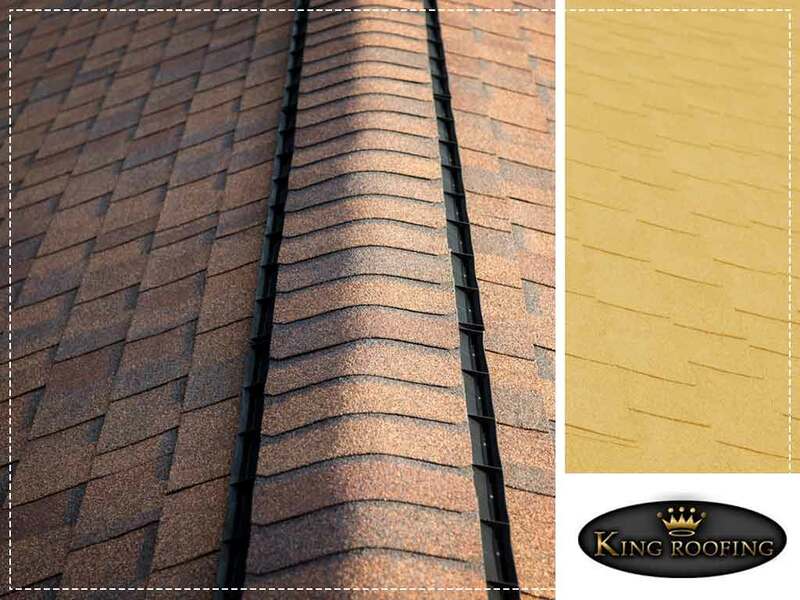 When looking for the best quality asphalt shingles, look no further than King Roofing, LLC. As a GAF Master Elite® roofing contractor, we provide you access to the best roofing materials on the market with the best long-term protection. We offer residential and commercial roofing services, including repairs, installations and maintenance. Give us a call at (903) 218-8777 for more information. You may also fill out our contact form for a free, no-obligation quote. We serve Athens, Canton and Gun Barrel City, TX, residents.